SimpliVity’s Data Virtualization Platform delivered on hyperconverged infrastructure simplifies IT and operations, and uniquely enables data mobility and efficiency. SimpliVity reduces IOPS, capacity and bandwidth requirements, and provides native data protection, eliminating additional hardware and tools—resulting in a 300% TCO savings. 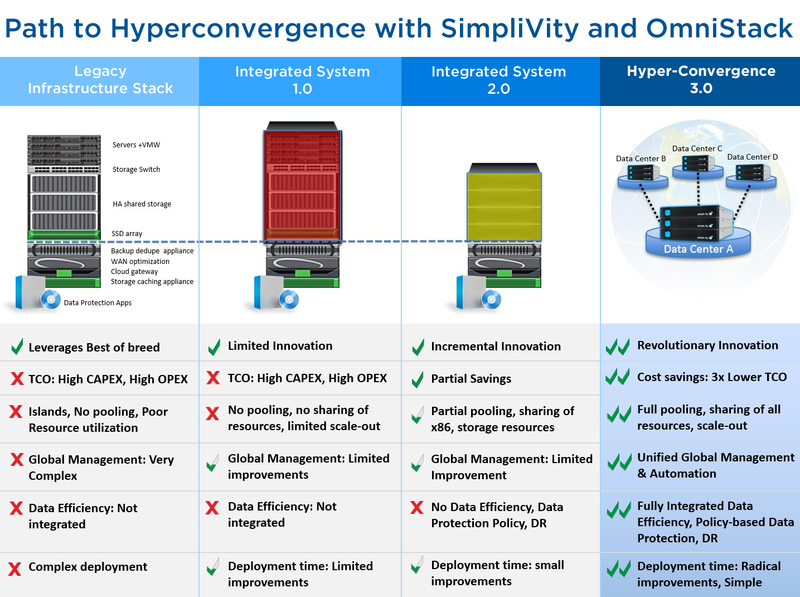 SimpliVity’s OmniStack is the industry’s first and only globally-federated and hyperconverged solution that supports Cisco Unified Computing Systems. Designed and optimized for the virtual environment, each OmniStack solution delivers server, storage, and networking services, as well as dramatic improvements to the management, protection, and performance of virtualized workloads—all at a fraction of the cost and extreme reduction in complexity compared to today’s traditional infrastructure technologies. Ensure applications get the resources they require. Deploy in minutes, not months. Save on training and maintenance. Eliminate the need for add-on backup and replication software and hardware. Reduce the cost of running the business, to fund innovating the business.